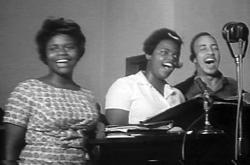 Freedom singing in Albany, Georgia, July 1962. © University of Georgia. Used with permission. This month D-Lib's featured collection is the Civil Rights Digital Library at the University of Georgia. European Conference on Information Retrieval (ECIR 2009), 6 - 9 April 2009, Toulouse, France. Call for papers, posters, and workshop and tutorial proposals. The submission deadlines are as follows: Papers 5 October 2008; Posters 19 October 2008; and Workshop and tutorial proposals 19 October 2008 . Electronic Resources & Libraries 2009, 9 - 12 February 2009, Los Angeles, California, USA. Call for papers. The submission deadline is 15 October 2008. Connecting to Collections, Institute of Museum and Library Services. Call for proposals. The submission deadline is 16 October 2008. IADIS International Conference e-Society 2009, 25 - 28 February 2009, Barcelona, Spain. Call for papers. The submission deadline is 20 October 2008. 5th International Conference on Web Information Systems and Technologies (WEBIST), 23 - 26 March, Lisboa, Portugal. Call for papers. The submission deadline is 29 October 2008. 6th International Conference on Information Technology: New Generations ITNG 2009, 27 - 29 April 2009, Las Vegas, Nevada, USA. Call for papers: Social Computing Track. The submission deadline is 7 November 2008.
International Conference on Computer Supported Education(CSEDU), 23 - 26 March 2009, Lisboa, Portugal. Call for papers. The submission deadline is 18 November 2008. 11th International Conference on Enterprise Information Systems (ICEIS), 6 - 10 May 2009, Milan, Italy. Call for papers. The submission deadline is 28 November 2008.